Discontinued model. The latest model is “LOS Series “, Maintenance parts for FiL Series are available for service. “FiL Series” has been discontinued and is incoming order production item. “LOS Series” is the latest model. 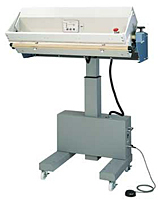 FiL series is an electric/air-cylinder operated extra-length sealer with an easy foot-switch operation. After adjusting the heating and cooling time according to the thickness and kinds of packaging materials, set the pouch to the sealing area. Depress the foot-switch to start sealing operation. After the set time, the upper sealing lever automatically returns to the initial position. The height of the head of the sealer can be adjusted to suit the package content by operating the switch on the center of the machine. At the time of ordering, the user can choose to have the exterior 2-line printing device FEP-A installed as a manufacturer option. (It cannot be installed after the purchase.) This allows the printing of texts and product dates. FEP-A is a hot-print-type printer that utilizes heated types to print carbon.